"The Daily Show" host played a game of "Los Panderos." 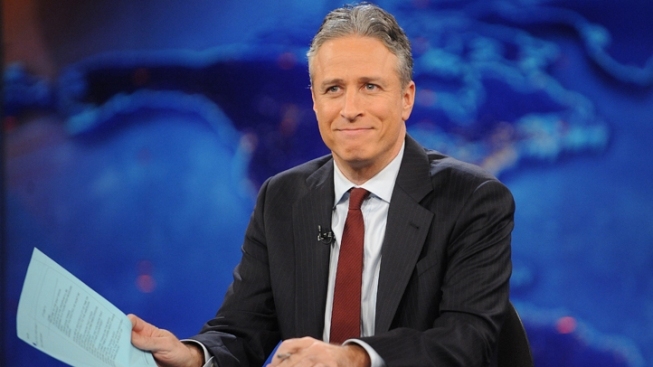 Jon Stewart poked fun at Obama's and Romney's Latino "pandering." On Monday's edition of "The Daily Show," Jon Stewart poked fun at President Barack Obama's and Mitt Romney's recent appeals to Hispanic voters at the National Association of Latino Elected and Appointed Officials (NALEO) conference. Stewart, accompanied by generic Latin-flavored music, announced at the top of the segment that the candidates' bids for Latino support called for a game of "Los Panderos." The object of the game: determine who did a better job galvanizing Spanish-language voters. The first round judged the candidates' opening statements at NALEO. Stewart didn't think highly of Romney's remarks. But he was very impressed by Obama's fluency with Spanish. "Now I know why the economy isn't doing so well. [Obama] spent the last three years doing Rosetta Stone tapes!" In the second round of "Los Panderos," Stewart considered the candidates' "connection to and comfort with the Mexican community." Obama name-dropped his Latina Secretary of Labor. But Romney won the round by referencing his father, who was born in Mexico. In the final round, Stewart looked at the candidates' positions on immigration reform. According to Stewart, Obama won that category handily—as evidenced by a recent USA Today/Gallup poll showing the president with a whopping 66% of support among Latino voters.